Mid-season patch, not much has changed except they fixed the spell power that made Kuku quite a bit weaker than he needed to be. I DON'T play conquest. At all. My least favorite mode. Try this if you want, but I'm not sure how well it'll work. Don't forget to thumb me; up if you like, down if you don't. Or neither if you just don't care! Waving your hands in the air is not necessary if you just don't care. Unless you're Kulk, then you're waving regardless. This is longer than it should be, probably. Kulkukan is not a weak god by any means, and is rather easy to be 'good' with. But to be great with him, you really gotta know how people are going to move and be able to hit your Whirlwind and Zephyr as soon as somebody is stunned/rooted/trapped. One of the only problems he has is the items are a bit pricey and you need to build stacks. However, building stacks will be really easy with Whirlwind in your arsenal. This is a CDR build, with no sacrifice to your spell power at all. Stacking CDR will allow you to cast your most annoying spell, Whirlwind every 6.6 seconds once it's maxed out. Think about that. 2.6 seconds after it's vanished, you can cast it again. And your ult every 48 seconds isn't a bad deal either. I'm rank 10 Kuku and have had a lot of success with this build. I would just like to post this image of how high you can get your spell power. This proves how absurd your passive( Power of the Wind Jewel) really is. #Amazing minion farming. One Whirlwind will wipe out a group of minions very easily. #Speed buff. Slipstream gives you 1 second of slow immunity and makes you go fast enough to use your Whirlwind and get out before somebody can gank you. #Just plain powerful. Between the amazing passive ability ( Power of the Wind Jewel), your get-away spell( Slipstream), your blast-attack( Zephyr), your AoE minion killer ( Whirlwind) and finally, your amazingly strong ult ( Spirit of the Nine Winds)... You're a force to be reckoned with. #Your main con is that you need to place your Whirlwind so people will be in it long enough to get the DoT on them. It will take practice and a lot of prediction skills to be able to hit people with it. #Same as above, but this time with your ult, Spirit of the Nine Winds. You'll have to shoot your ult about 1-3 seconds ahead of where they WILL be when you fire it off. This will take practice. #Your items cost quite a few pretty gold pieces. Stacking mana buff, which gives you more spell power along with your passive ability. I get this first because stacks are stacks. Mana gives Kuku more spell power, CDR for more abilities. 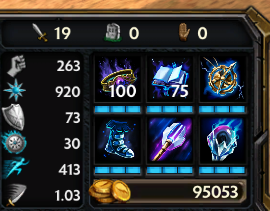 Movement speed, you know, normal smite shoes. This seems to be where I differ from a lot of builds I see. Chronos' Pendant will give you some delicious CDR, a bongo of spell power, with a hint of MP5 to keep your mana up for those long games. A core item to any mage build. 125 spell power, some MP5, and the awesome passive. Once you get this, you'll see a major increase in your damage. Spell power, health, mana, and a slow. This item is great for when you do land your Whirlwind right in somebody's face(or their whole body) and they can take just that more damage from you. Penetration! If you have this and somebody gets hit by your Whirlwind, their magic defense is going to take a heavy hit. If you can follow up with your ult, you'll hit like a truck. Spear of Desolation is cool because of the passive, power, and penetration. I'd suggest this if the team is relatively weak in the magic defense, otherwise you'll get more actual damage from something with higher penetration. Ethereal Staff for extra health and mana, plus the effect should push your spell power quite high, fully buffed and at max level you should have over 900 spell power. You can get these in place of Shoes of Focus, Gem of Isolation(althogh this has synergy with Ethereal), or Chronos' Pendant if you don't want to build CDR... But that's kinda what this guide is about, spamming Whirling as much as possible. Maybe not fire breath... But wind works just fine it seems. Gives you spell power equal to 5% of your mana. This is amazing. This makes you able to actually hit the cap of 900 and even go above it. Gives you a nice little slow and the small AoE blast radius is actually quite nice if somebody is trying to hide too close to one of their minions while they're poking. The slow will let you pop down your Whirlwind and get the DoT on them before they can get away, hopefully. Your getaway spell. If you run up the enemy team and throw down a Whirlwind, you'll probably end up using this to get away before they can land an attack on you, possibly slow you, and then possibly kill you. It'll make you immune to slows for 1 second, so if you do get hit by a slow during that time, you're in luck! The bread and butter of Kulkukan. Build this up first, this is what will build your stacks from killing minions. When you're farming stacks, throw this down right in front of the minion. That one and all the others behind it will get hit, provided you got them before they reach your minions. If they do reach out minions, you should be able to place it just good enough that it's barely hitting the archer minions and hitting the melee minions as well. The DoT will also tear up gods something fierce. You can place this spell down to cause a bottle neck then use your Spirit of the Nine Winds right afterwards to hopefully land a kill. If you got a melee on you or a melee wants to be on you... Just put it right on yourself and hang out in it until you can get away. If you're running away, place it just a little bit in front of you so they'll be forced to run through it. If you're being chased by a hunter, put it right on top of yourself and keep going. This is extremely effective in small lanes, like the "jungle" in the joust map. Your ultimate spell. It hits like a truck and can be hard to hit things with. Aim ahead about 1-3 second of where you hope the enemy will be once it finally pops out. If you see the enemy stunned/rooted/trapped, that would be the ideal time to use this spell. Right after you blast them with a Zephyr to slow them down. Anything that ensures you hit them with this. It can hit for over 1,000 damage very easily on a non-tanking character. You can use this when a melee is right on you. Just turn towards them and blast while backing up, as a last resort type of thing. Friends are your greatest weapon! If you got a team that can stun/root/trap people, you'll be set. Dropping your Whirlwind down in Odin's Ring of Spears will really mess people up. Anubis trapping people before his ult and dropping Whirlwind will pretty much ensure they are going down. Throwing a Zephyr at them won't hurt you any either(unless it's nemesis). Having a Hades on your team will probably be the best you can ask for, as far as.... all your spells go. His Pillar of Agony is amazing for dropping your Whirlwind in, using Zephyr and your ult. Ares is also good to have, but considering how many people buy beads against him and not Hades(since you can just jump away from Hades, I think Hades is a better partner. Sure, you can. It'd probably be best to replace a lower pen item instead, as pen over 100 is when you'd use shard. The mana from Gem also helps your passive give you more power. You can always try a 1v1 with a friend and try your damage with various pen/defenses. 106529 Manswaggle [quote=YourOnlySavior] Can I replace Gem for obsidian shard [/quote] Sure, you can. It'd probably be best to replace a lower pen item instead, as pen over 100 is when you'd use shard. The mana from Gem also helps your passive give you more power. You can always try a 1v1 with a friend and try your damage with various pen/defenses. Nice guide. What relics would you guys recommend? Assault, meditation and pretty much whatever you want. If there's a lot of healers, curse(but the healing reduction item is pretty good if you hit people with whirlwind). Aegis is good if you're quick enough, beads and aegis is good for Ao Kuang's ult. Frenzy/20% is good for popping right before your ult, I think. Scout is alright if you're into that. It really depends on what you're against, but if you feel you need mana early game in any game mode(save conq because I never play it), Meditation is bomb. Though the CD is long. I've had fun with Sunder from time to time, just because another thing to shoot. 106402 Manswaggle [quote=Agartha] Nice guide. What relics would you guys recommend? [/quote] Assault, meditation and pretty much whatever you want. If there's a lot of healers, curse(but the healing reduction item is pretty good if you hit people with whirlwind). Aegis is good if you're quick enough, beads and aegis is good for Ao Kuang's ult. Frenzy/20% is good for popping right before your ult, I think. Scout is alright if you're into that. It really depends on what you're against, but if you feel you need mana early game in any game mode(save conq because I never play it), [[Meditation]] is bomb. Though the CD is long. I've had fun with [[Sunder]] from time to time, just because another thing to shoot. 106401 Agartha Nice guide. What relics would you guys recommend? 106329 Manswaggle [quote=Technotoad64] The "team work" section is unclickable, because it is inside of the fade at the end of every guide. You're going to have to add a few lines of transparent or black periods to make the section visible, like this:-snip- [/quote] Fixed, thanks. Did some testing and moved things around. 99690 Manswaggle [quote=MingePot] wheres the pen bro, you wont be doing much dmg late game without pen [/quote] Did some testing and moved things around. Cool guide! I'm a big fan of Kukulkan myself, and love his playstyle. I have not tried the Warlock's Sash start yet, so I'm looking forward to giving it a shot. My only criticism is that the guide is kinda boring color wise, maybe just throw in some extra color there? Mostly my personal preference, but color does help to catch the eye. Also, it seems you've left out the section on gameplay which is a bit distressing. The items and skills sections look fine to me, but what's a guide without practical applications? I'll upvote as soon as I see a gameplay section. I kinda mashed the gameplay in with the skills. Suppose I could delete the skills section and remake it as gameplay. I don't see the point of leaving the skills as they are and then add a gameplay section that pretty much says the same thing. Whenever I do a guide it's mostly because there's not much that's updated for the new items or I just play differently than other people. So, I don't expect upvotes, actually. Usually just expect for downvotes, that way I'm not disappointed if I get negative reviews. As for the colors, eh. I'm not good at this stuff, so I won't pretend to know what I'm doing and try to add colors and end up making it look worse. If you feel like copying this guide any and just rewording things, I honestly won't mind. Again, I just put it up because I noticed a few of them were out of date with the items, and when you search "Kulkukan" in the guide section there's only one other one. All the others are still named after Ao, since that was a strange reskin they did and added Ao as a different playstyle god altogether. 85767 Manswaggle [quote=MaddJack] [color=#ffffff]Cool guide! [/color] I'm a big fan of [[Kukulkan]] myself, and love his playstyle. I have not tried the [[Warlock's Sash]] start yet, so I'm looking forward to giving it a shot. My only criticism is that the guide is kinda boring color wise, maybe just throw in some extra color there? Mostly my personal preference, but [color=#ff0000]c[/color][color=#ff8000]o[/color][color=#ffff00]l[/color][color=#00ff00]o[/color][color=#00ffff]r[/color] does help to catch the eye. Also, it seems you've left out the section on gameplay which is a bit distressing. The items and skills sections look fine to me, but what's a guide without practical applications? I'll upvote as soon as I see a gameplay section. [color=#ffff00]Otherwise, great guide! [/color] [/quote] I kinda mashed the gameplay in with the skills. Suppose I could delete the skills section and remake it as gameplay. I don't see the point of leaving the skills as they are and then add a gameplay section that pretty much says the same thing. Whenever I do a guide it's mostly because there's not much that's updated for the new items or I just play differently than other people. So, I don't expect upvotes, actually. Usually just expect for downvotes, that way I'm not disappointed if I get negative reviews. As for the colors, eh. I'm not good at this stuff, so I won't pretend to know what I'm doing and try to add colors and end up making it look worse. If you feel like copying this guide any and just rewording things, I honestly won't mind. Again, I just put it up because I noticed a few of them were out of date with the items, and when you search "Kulkukan" in the guide section there's only one other one. All the others are still named after Ao, since that was a strange reskin they did and added Ao as a different playstyle god altogether.